Today when I logged on I saw that the saber icons above avatar pics were all messed up due to photobucket doing some stuff on their end. I informed John and he is working it out. If you guys see issues like this in the future please let us know. Not sure how long it has been that way and for those sabers it I more or less irrelevant but if pics go missing or something from guides or threads it can be detrimental. John has worked on the issue some but I saw some are still the same way, so please bear with us as we get this issue fixed. Thanks. Also thanks John for helping with this issue. I am about as tech savvy as a turtle so it good to have others who can fix these things for us. Most everything is hosted elsewhere. The very early stuff from the original owner is setup this way. On a different subject, didn't you have an avatar photo? Where'd it go? No I don't think I ever put an avatar photo up. Truthfully it may have been messed up before I noticed it for an unknown amount of time. I try to hit every new post to read them for content as well as making sure things are smooth around the forum and then sometimes behind the scenes so when it comes to things like the post counts and avatar pics I really skim, so it can be easily missed. I think we have the issue taken care of but I have ben offline a couple of days as football practice has started for my kid. 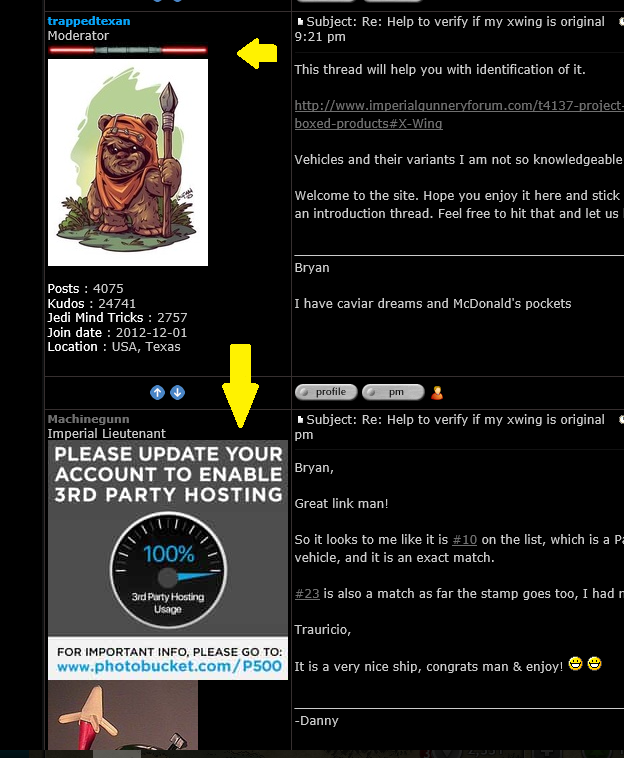 As many know, recently Photobucket asked their users to pay a fee to continue using their service to host images on places like forums. This has resulted in some TIG images being forcibly removed. We're working on replacing these. Please feel free to update any of your missing photos and take advantage of our Servimg or Galleries options which are completely FREE to use. I was pretty upset to see Photobucket change their terms. I used them quite a bit and had images over four different forums all get "blacked out". I'm not about to start paying for 3rd party, so if you have some sort of fix or hack to share, that would be fantastic! $19.99 a month is still too much to pay for photo hosting. As long as other sites still allow 3rd party, I'll use those. And the internet — now with tons upon tons of "Please Update Your Account to Enable 3rd Party Hosting" placeholder images.